A successful dental implant can be measured only by the final results of the dental implant treatment. One may think that an implant is only considered to be a dental implant failure if the dental implant itself has not fused with the jaw bone. 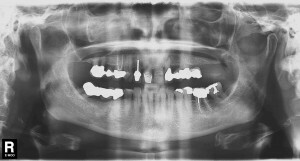 Unfortunately sometimes even though the dental implant has integrated with the bone it may still be considered a dental implant failure if the final result is poor. The most common type of dental implant failure is of the dental implant failing to integrate with the jaw bone. The dental implant should not become infected or move. If the implant was properly placed initially and if the implant has been taken care of the chances of dental implant failure are very small. However, dental implant failure increases if the surgery isn’t done by a skilled practitioner who carries out dental implants routinely. Poor oral hygiene can be detrimental to dental implants succeeding. If the implants should fail the implant may become infected and will need to be removed due to dental implant failure. The chance of dental implant failure is around 2%-4%. 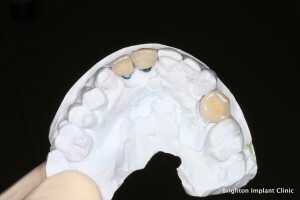 Dental implants at Brighton Implant Clinic are of Implant Direct Sybron type and have a proven track record. If the implant should become infected it will need to be removed. Afterwards the area where the implant was removed will be left to heal. This may take 3-6 months. After the healing period an implant can be placed into the same area if there is sufficient bone. There are ways on how you can prevent a dental implant failure. Tips to avoid encountering dental implant failure. 1. To Avoid dental implant failure When choosing your dental implant clinic, perform a personal research to scout your options. Ask people you know who have dental implants about their experiences, what clinic performed the implant, and what the outcome was. They will certainly have recommendations that you can consider when it’s your turn to have the surgery. 2. To Avoid dental implant failure Find clinics with highly qualified specialists to prevent dental implant failure. The surgeon who will perform the dental implant should have proper training and experience to do the surgery correctly and predictably. 3. Obtain a thorough dental implants assessment plan and treatment plan. Check all fees to see if there are any hidden charges. A trusted clinic is honest and will not bill you without your knowledge. 4. Get a second opinion to avoid Dental implant failure. Ask about solutions and alternatives in case a dental implant problem arises. 5. To Avoid dental implant failure Check the background of the clinic and its dental professional. Determine how committed they are in their field and how experienced they are. See how many happy patients they have helped. 6. To Avoid dental implant failure Never hesitate to ask about the surgery even the littlest details that concern you. This will make you feel a lot more comfortable to undergo the process. 7. Inform your dentist about your medical history to Avoid dental implant failure. If you are suffering from a medical condition or taking medications, you should inform your dentist to avoid dental implant failure before the surgery. If you don’t, it can cause dental implant failure especially if you have medical problems such as diabetes or a heart condition. At Brighton Implant Clinic we have helped many patients enjoy the benefits of dental implants. We are highly experienced in dental implants, our clinic which was awarded two UK National awards in 2009 and 2010 has earned a reputation for high quality dental implant treatment at an affordable price.